Whether you're looking for insight and inspiration to renovate your own Victorian property, or are simply curious to see what can be achieved, this gorgeous semi is a great example of a space designed with family living in mind. Awash with original features yet equipped with the latest home comforts; light and spacious but with cosy areas; sophisticated yet playful; bursting with colour and pattern yet calm and homely. These might sound like contradictory descriptions, but Paul and Laura Clark have managed to strike the perfect balance between old and new in their stylish Victorian semi. Browse more of our standout real home renovations when you're done, too. Read our guide on renovating a house, too, for more guidance. Having been lived in unaltered by the previous owners for eight years, the interior was dark and dated, but it also boasted well-preserved original features. ‘It had plenty of character combined with the potential to extend and add our own stamp.’ says Laura of the property. Although it had lovely features, the kitchen was a narrow galley kitchen which wasn’t spacious enough for a growing family. After carrying out essential repairs including repointing, rewiring and damp-proofing, in 2016 the pair turned their attention to the grand plan: adding a kitchen extension. Although a scaled-back version of the original design, the finished space has transformed family life. When it came to decorating, despite it being a first-time project, Paul and Laura weren’t afraid to break the rules, mixing furniture from across the centuries and embracing a vivid palette and pattern. Muted walls and stripped-back floorboards provide a neutral backdrop for statement furniture and graphic prints. To keep the space cosy, the couple fitted a Huntington 30 gas stove from Beautystone Fireplaces. The mirror is from Loaf and the bespoke storage is painted in Farrow & Ball’s Calke Green. A Daisy bouquet from Bloom & Wild adds a pretty finishing touch. A slouchy mustard velvet sofa from Rose & Grey sits under an eclectic print collection. "Period homes aren’t perfect, so we were relaxed about introducing pattern and colour – the busier the better! The rooms are a good size, so can take bold touches." The vibrant living room scheme sets the tone for the rest of the house. 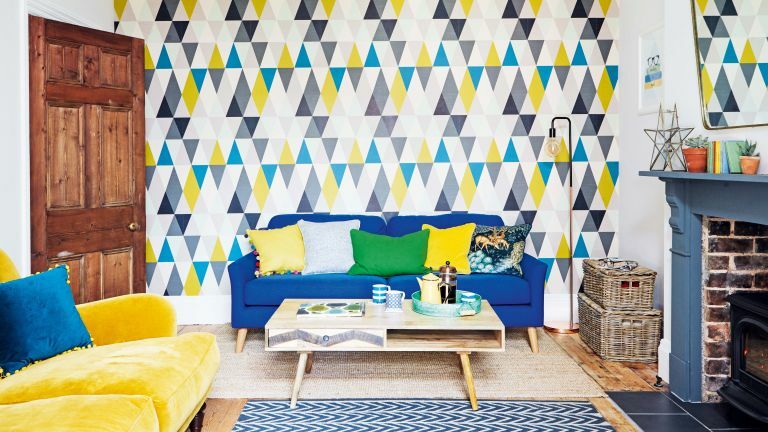 Taking inspiration from the original Minton-tiled hallway floor, Paul and Laura chose statement Geometric Prisma wallpaper from More By Design at Not on the High Street and have teamed it with a striking blue sofa from Made and a coffee table from Swoon Editions. The floor lamp is from The Clementine in Fowey, Cornwall. A large Crittall window and two skylights flood the extended kitchen come dining space with light. Reclaimed parquet flooring helps to zone the cooking and dining areas, and also brings extra warmth to the space. Paul and Laura chose to keep the existing quirky floor-to-ceiling pine cabinets and have complemented them with a country-style table from Pine Farmhouse Table. For a similar storage bench, try The Cotswold Company. A simple kitchen featuring two freestanding units and stand-alone appliances helps keep the open-plan room relaxed and spacious. Paul and Laura upcycled the dresser from the original kitchen with a lick of Farrow & Ball’s French Gray and added a deep pine worktop. Apple crate storage drawers were fitted by local company Country Cousins, who also made the central island, painted in Farrow & Ball’s Down Pipe. The splashback is tiled in mixed Batik tiles in blue by Topps Tiles and the pendant lights are from Any Old Lights in Cornwall. A window mimicking the original style was added to the extension to complement the house’s period character, while mix-and-match Mid-century and traditional chairs create a relaxed, contemporary feel. Before the extension was added, the front room was the main living space, but it now serves as a more formal room. Paul and Laura chose a serene scheme with walls painted in a light dove grey and furniture from Laura Ashley. Shutters were fitted along with a window seat by a local carpenter, finished with a bespoke cushion in a Laura Ashley fabric. When they stepped through the front door, the couple were struck by the beautifully preserved period features, such as stunning stained glass and the Minton-tiled floor. Henry’s bedroom is papered in Scion’s Mr Fox wallpaper. Paul and Laura bought the hospital-style bed online and spray-painted it yellow. Farrow & Ball’s Gable wallpaper makes a playful yet sophisticated backdrop in Edith’s room. The rocking chair was bought on Ebay and Laura made the teepee using fabric from Dunelm. The couple opted for a calming and feminine scheme in the bedroom, creating a pretty backdrop with an archive Farrow & Ball wallpaper, Melrose. The bed is from Laura Ashley and the vintage chest came from Country Homes in East Dulwich. Bespoke cabinets are painted in Farrow & Ball’s French Gray, a shade used frequently throughout the house. Looking for more renovation inspiration?